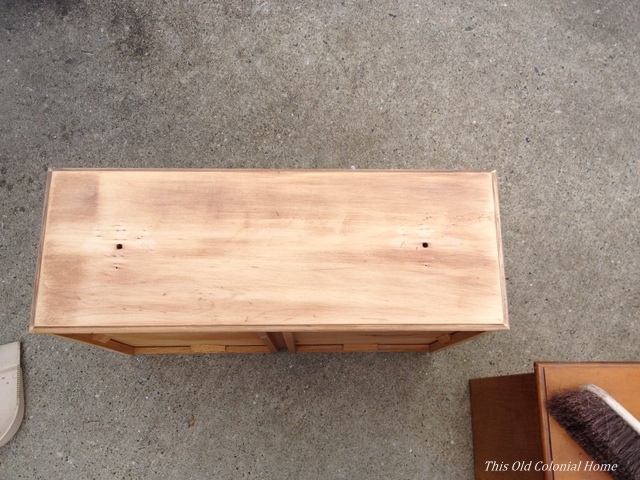 In Part 1, I showed you our distressed shelf. Now for the mirror. Remember the one I got at an estate sale for 20 bucks? (See it here.) 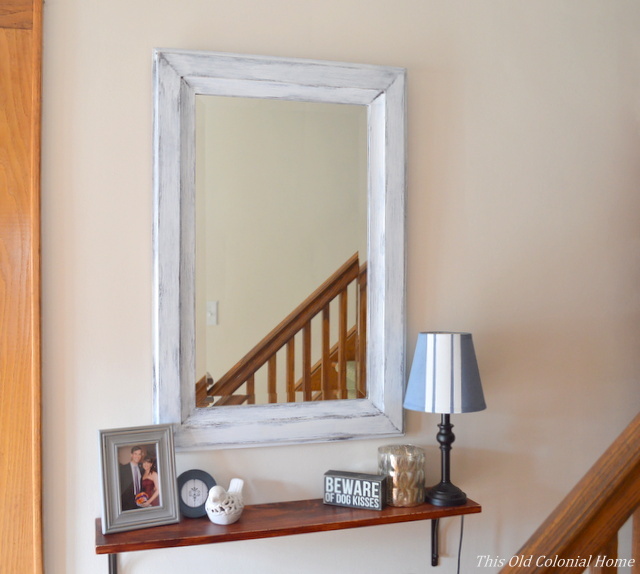 That’s the same mirror I used for this project. Originally it had peeling green paint with pink showing through. 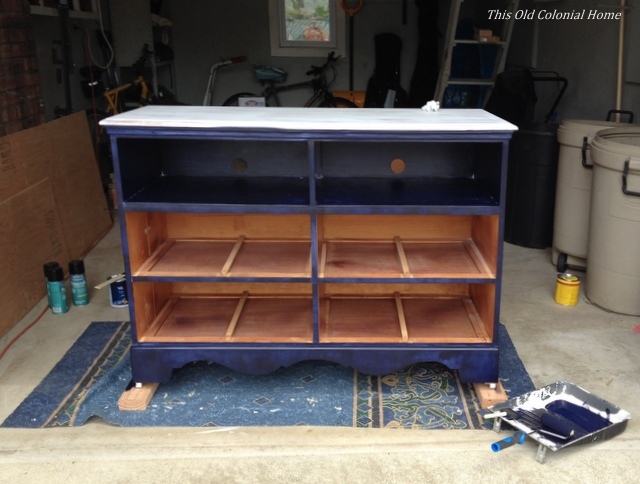 I decided to redo it with a white distressed look. I had never done that before. So I started searching online and I found several ways to do it. I used part of one method and then sort of winged it. 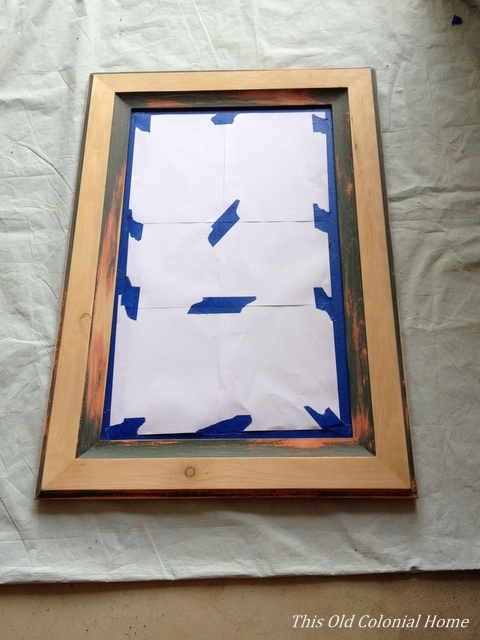 I started by sanding the frame. 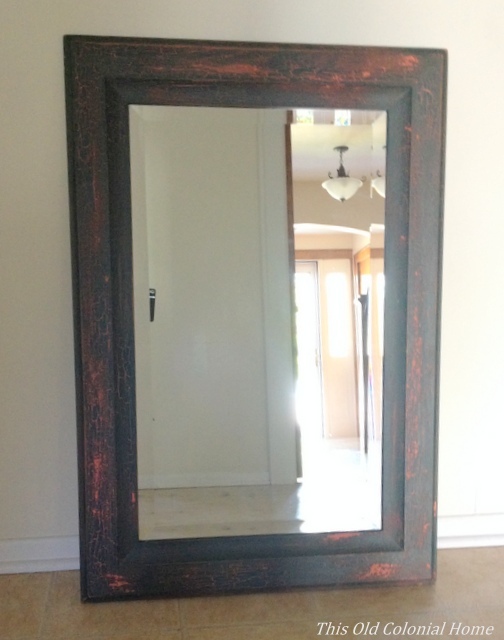 Be sure to cover the mirror so it doesn’t get scratched. (I learned that the hard way. Oops. I really should’ve known better. Luckily it was a small scratch.) The flat part of the frame I was able to easily sand with an electric sander, but the angled edges I had to do by hand. It got pretty tedious so I did it just enough to get the flaky paint off. I then primed the frame using a foam brush. 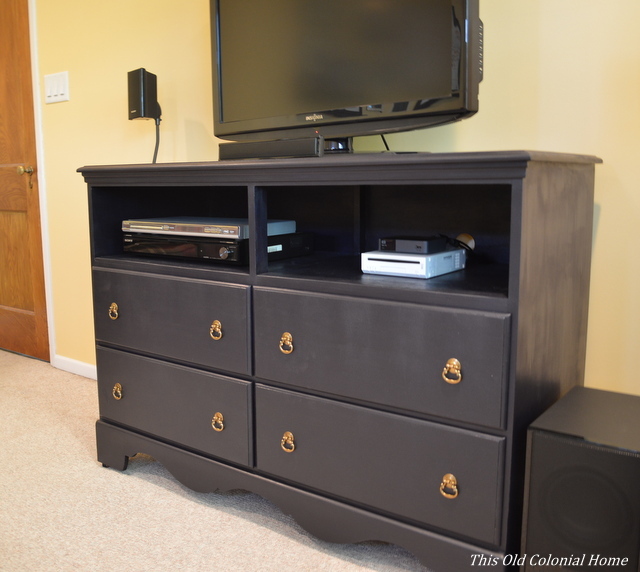 After that, I painted it brown with latex paint I had from a previous project. It took a few coats to get it dark enough. Then, I simply went over the brown paint with white paint using a bristle brush and light strokes — the idea being to let the brown show through a little. 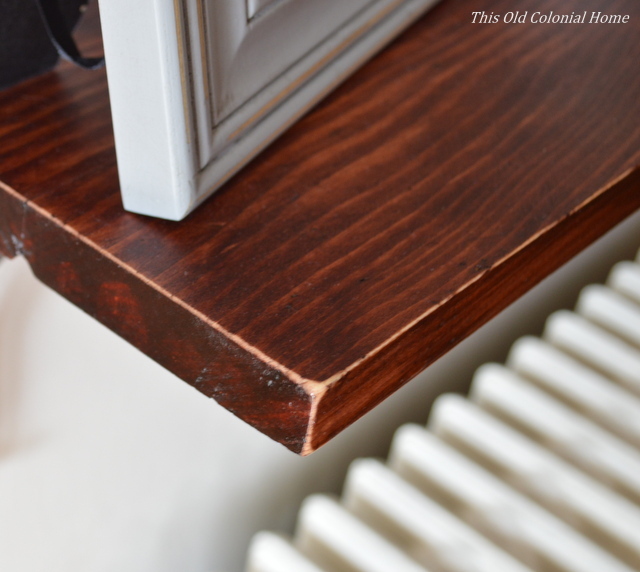 After it dried, I sanded parts of the edging and corners by hand to help give it a more distressed look. This might not be the perfect method to distress something, but in the end it achieved the look I was going for. 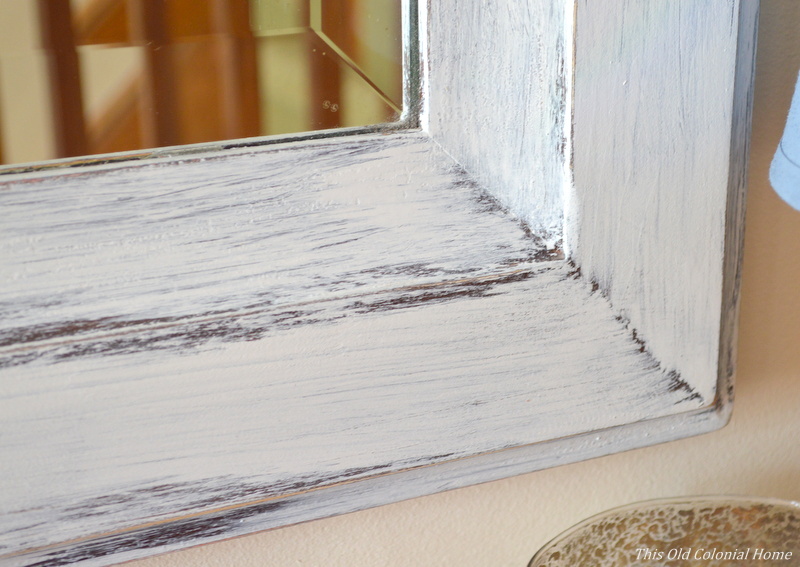 The only thing I bought for this project (aside from the mirror) was a quart of white paint for around $8. Everything else I already had on hand. I always try to use leftover materials when I can to cut down on cost. As you’ll see coming up in Part 3, I do just that to make over a plain lamp shade. 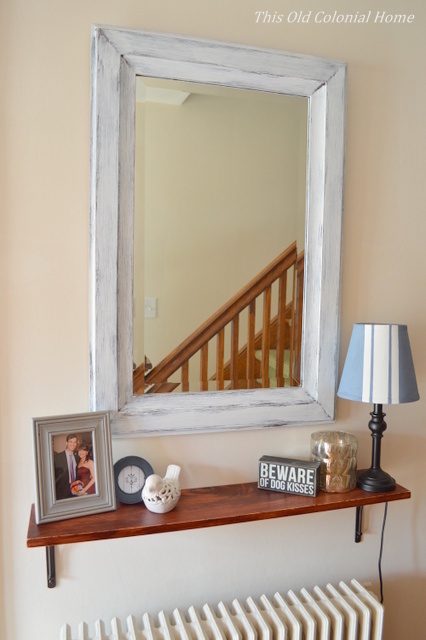 Categories: DIY | Tags: distressed mirror, entryway, estate sale, paint, sanding | Permalink. 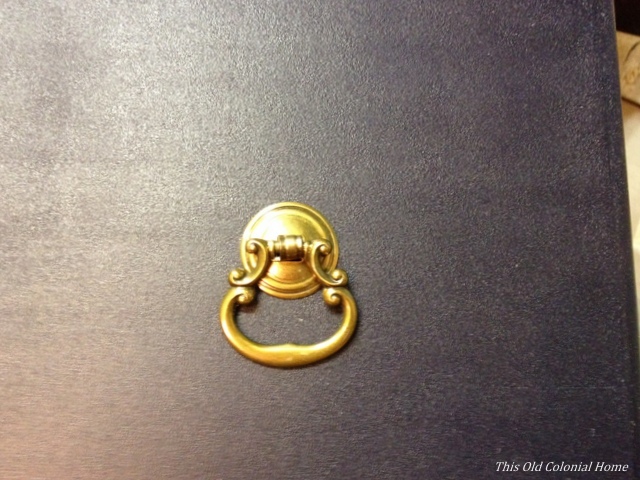 We’ve been churning out several projects faster than I can post about them! Take for instance the latest addition to our entryway. This alone contains 3 DIY projects!! Let me start with the shelf. 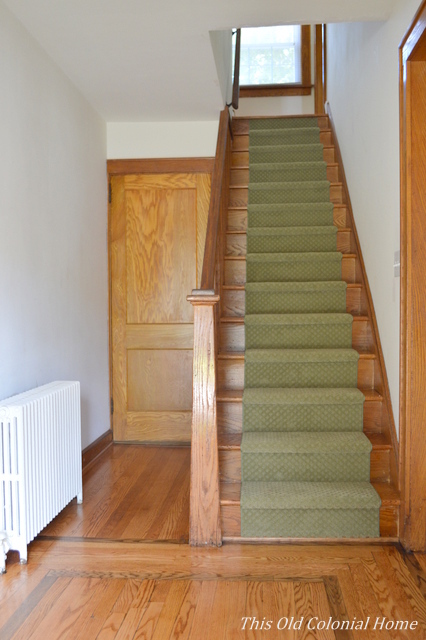 First of all, the walkway by our stairs is somewhat narrow, and having a radiator there doesn’t help much. It used to have a cover over it, but we removed it to make a little more room. That worked, but we still needed somewhere to drop our keys, sunglasses, etc. A table didn’t seem logical so we decided to build a shelf instead. We wanted a somewhat rustic look using wood and metal. 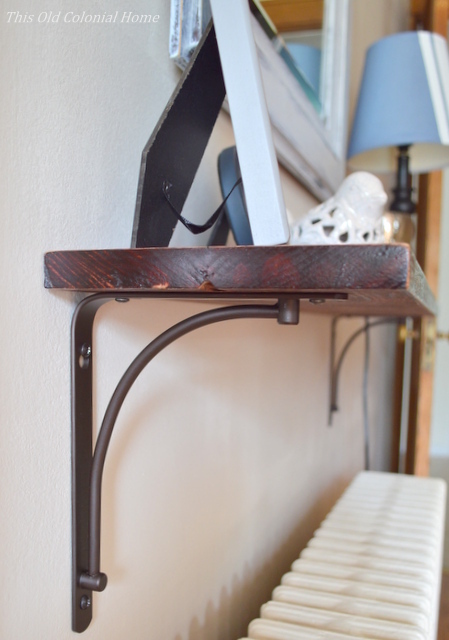 Reclaimed wood and old iron brackets would be ideal for something like this. But we didn’t want to have to search high and low for materials, so we headed off to Lowe’s. We picked up a 6 foot piece of 1×4 pine and 2 metal brackets for around $20. Jamie cut the board in half and screwed them together using pocket holes that he made with a Kreg jig. 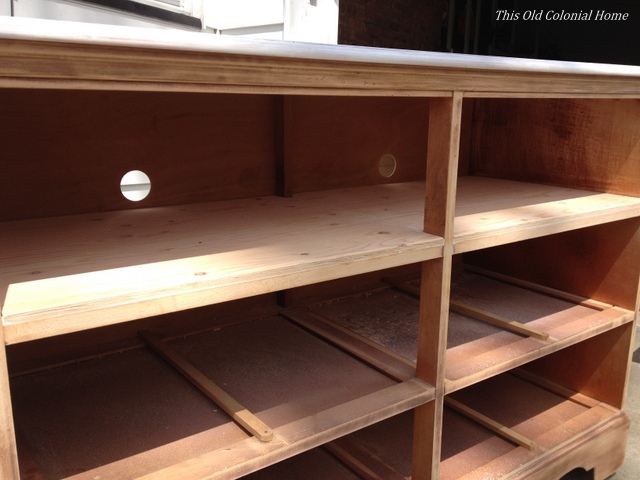 We now had a shelf that was 36″ long by 7″ deep. The top of it was a little too smooth for my liking … so I beat it up! I put a bunch of screws in an old sock and banged it against the wood. 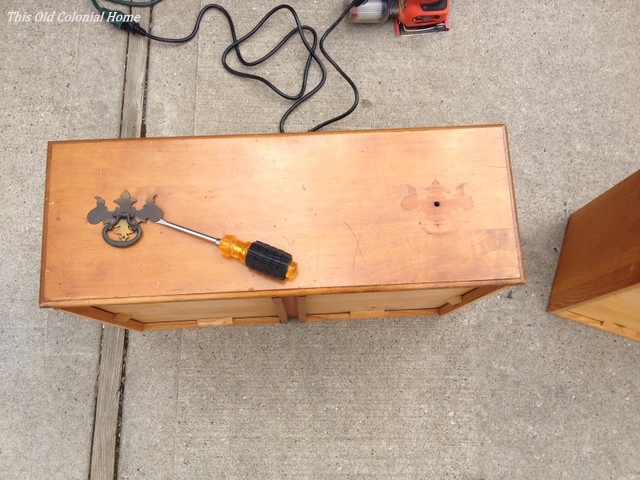 I also made random markings using both a hammer and a screw driver. (This is a good opportunity to release some stress!) 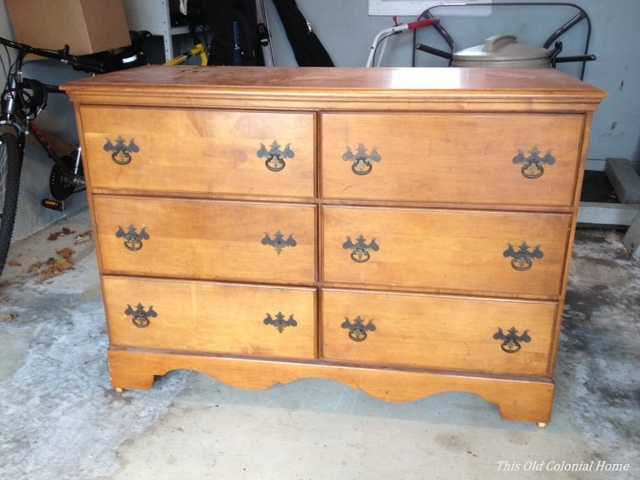 Once it no longer looked new, I brushed two coats of Minwax Bombay Mahogany stain on it. After it dried, I went over the edges and corners with sand paper to make it look a little more worn. You can do this as much or as little as you want. Jamie then attached the brackets to the wood and hung it on the wall. 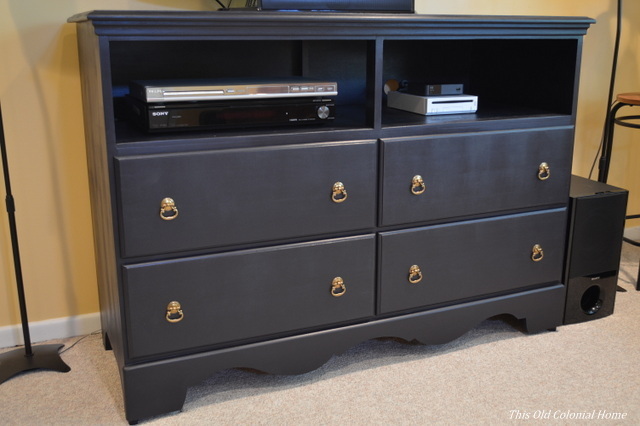 Such an easy and affordable DIY project! 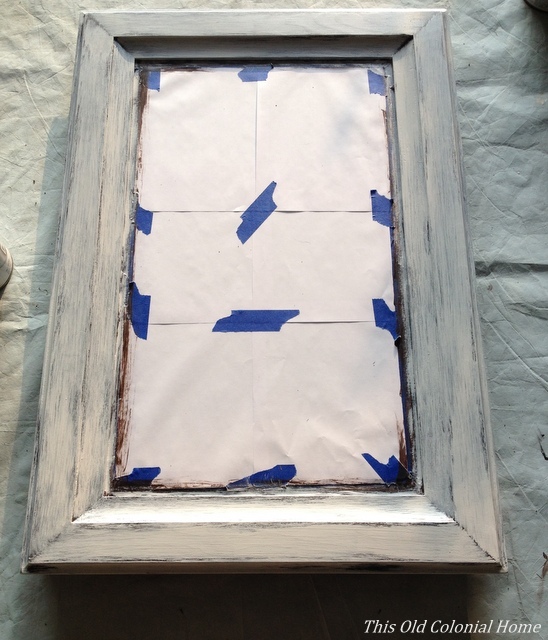 Coming up in Part 2, I’ll show you how I distressed a wood-framed mirror. 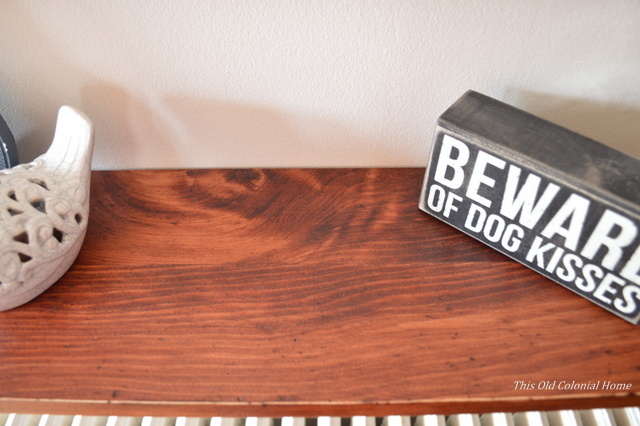 Categories: DIY | Tags: entryway, Minwax stain, rustic wood shelf, sanding | Permalink. 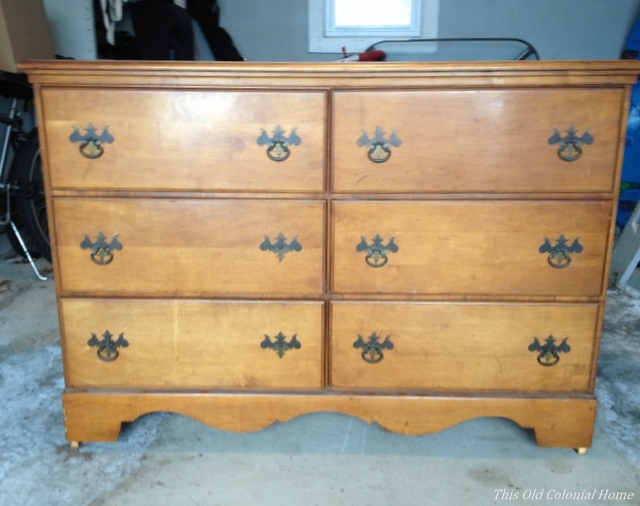 You may recall several months ago I snagged a free dresser that someone was throwing away. It was literally sitting in the snow amongst other garbage before I rescued it. 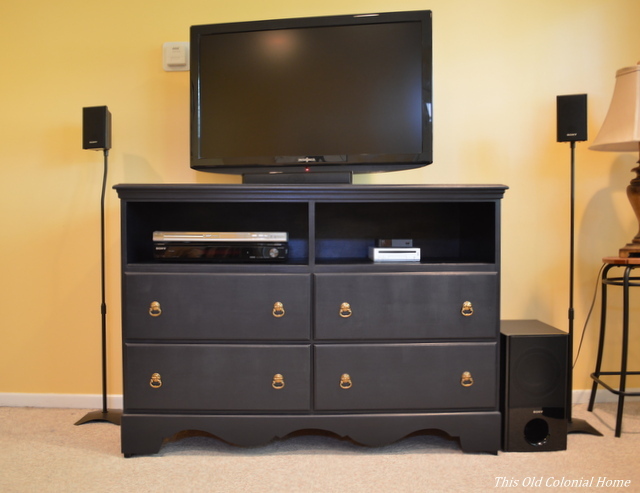 The plan was to turn it into a TV stand. After a good cleaning and sitting in our dining room through the remainder of our endless winter, that idea has finally come to fruition! 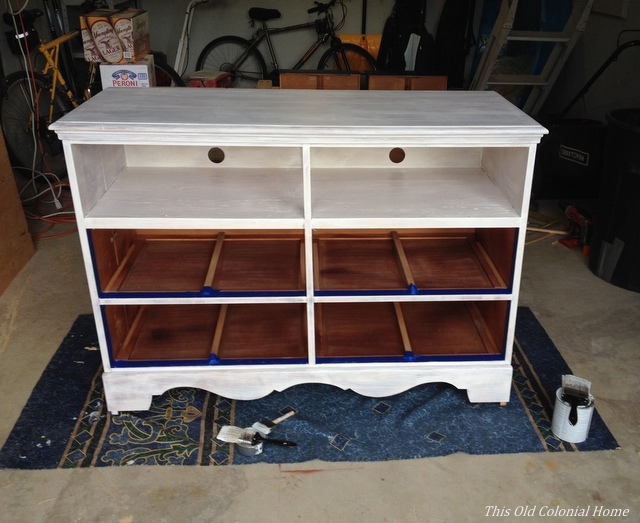 It needed to be refinished and I knew I wanted to paint it, so I started with the drawers. 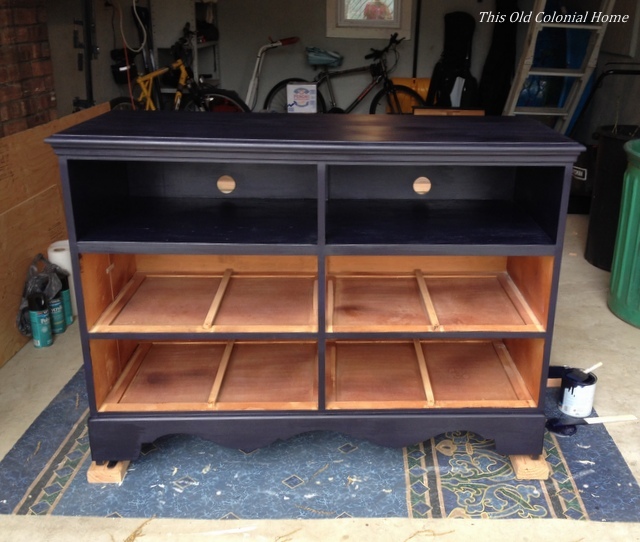 I took off the hardware and began sanding it with my new electric sander. (Thanks, honey!) 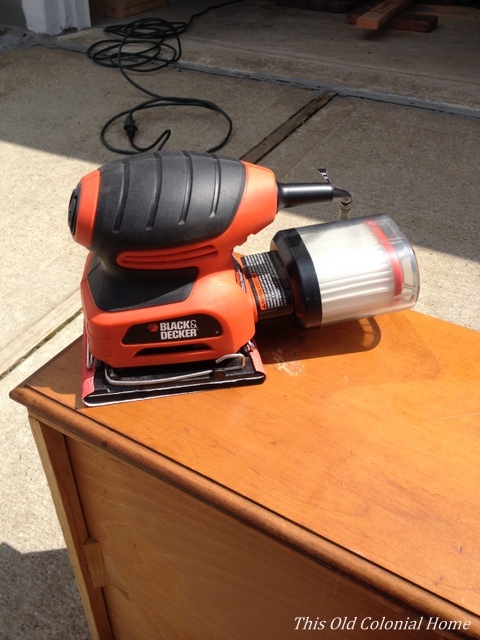 I highly recommend using an electric sander for big jobs. I had a battery-powered one for a previous project and it always died quickly. Electric is way better because, in my best Tim the Tool Man Taylor impression, it has more power! I used course sandpaper – 80-grit – to start and then went back over with finer 150-grit to smooth it out. I then took the same approach on the base, going over some of the smaller areas by hand. 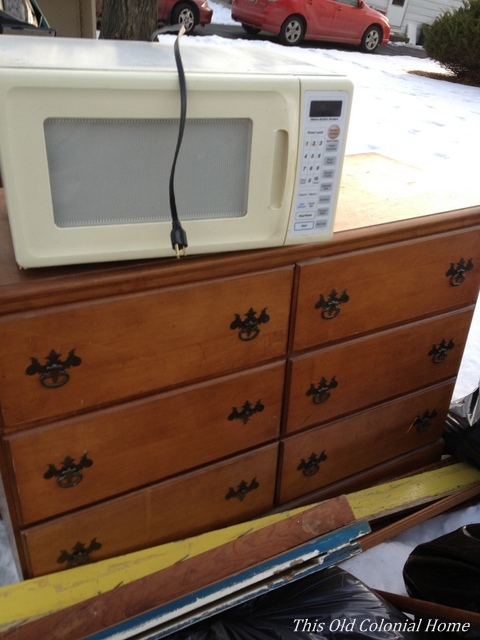 The plan was to keep the top two drawer areas open. 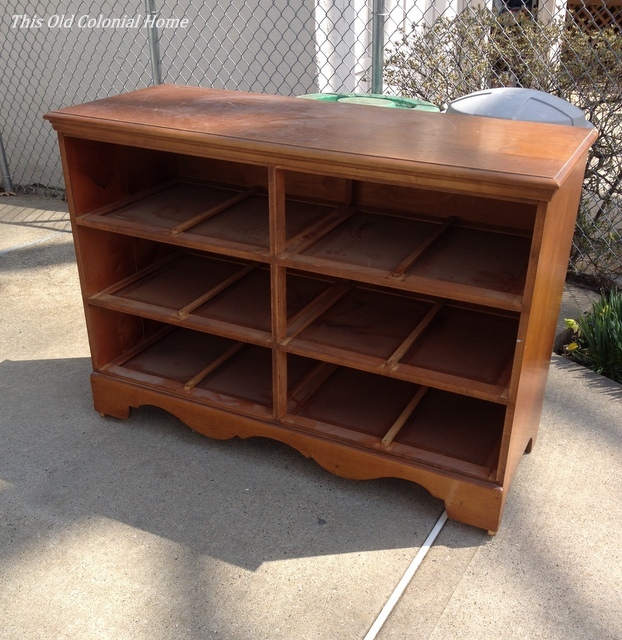 This is where we would put our DVD player and such. 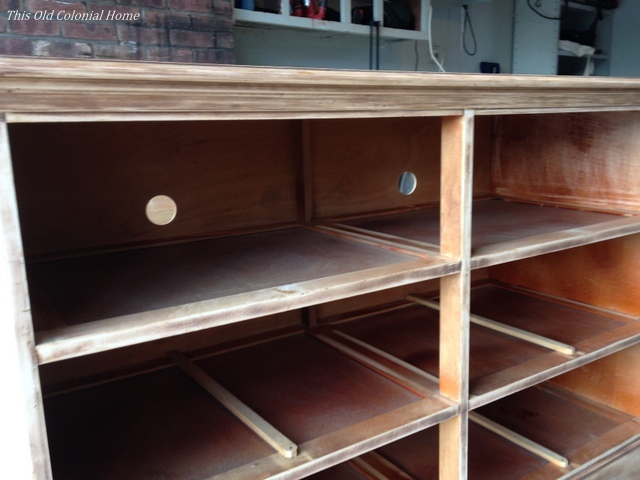 My husband drilled out two holes in the back for the cables to go through … and he measured, cut and added plywood to make for a sturdier shelf. He also added a few brackets on the inner sides to support some minor splits in the wood. After wiping it all down with a wet cloth, I then started to prime it. 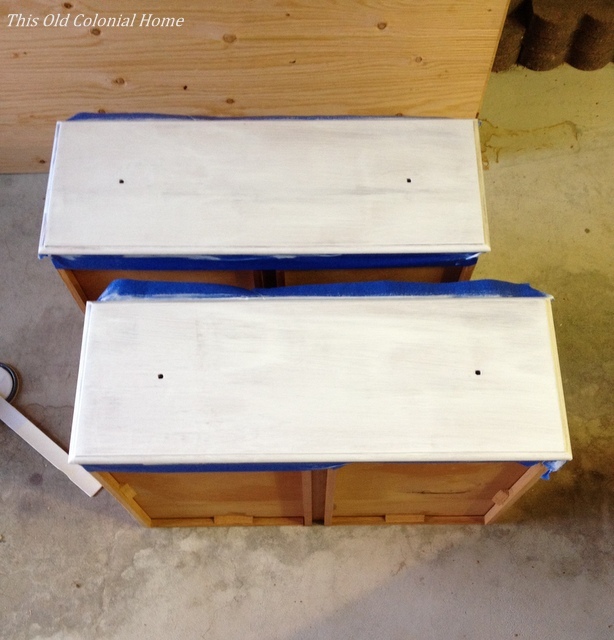 I used one coat of Zinsser Primer that I applied with a paint brush. Once it dried, I lightly sanded it with 180-grit sand paper and then wiped it down one more time. It was finally ready to paint! 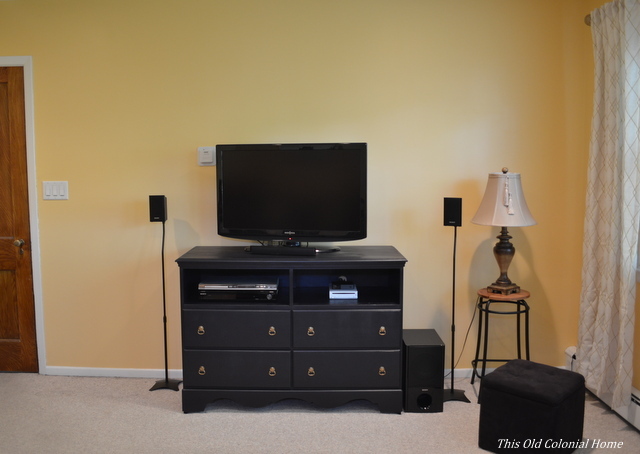 I chose regular latex paint – Mystified by Valspar in semi-gloss. I applied light coats using a foam roller and foam paint brush. To get the dark look I was going for it actually ended up needing 4 coats! I thought the painting would never end! 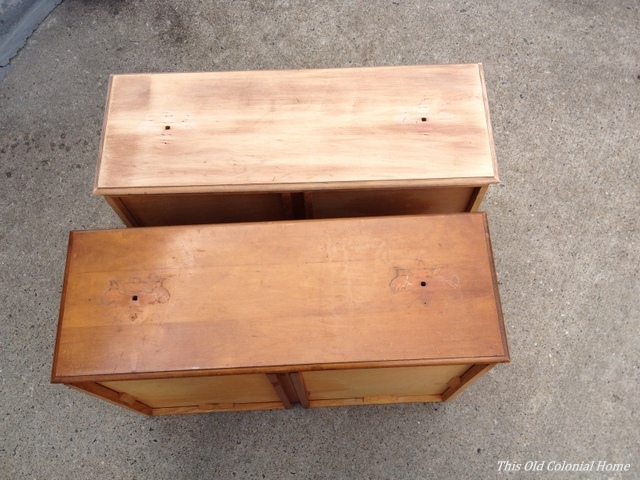 The drawers weren’t so bad, but doing the shelf area was kind of a pain. 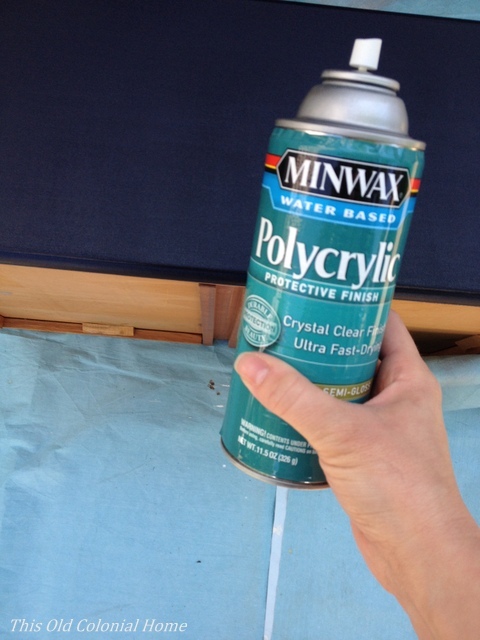 I’m not sure how necessary it was, but I also ended up sealing it with Minwax Polycrylic. 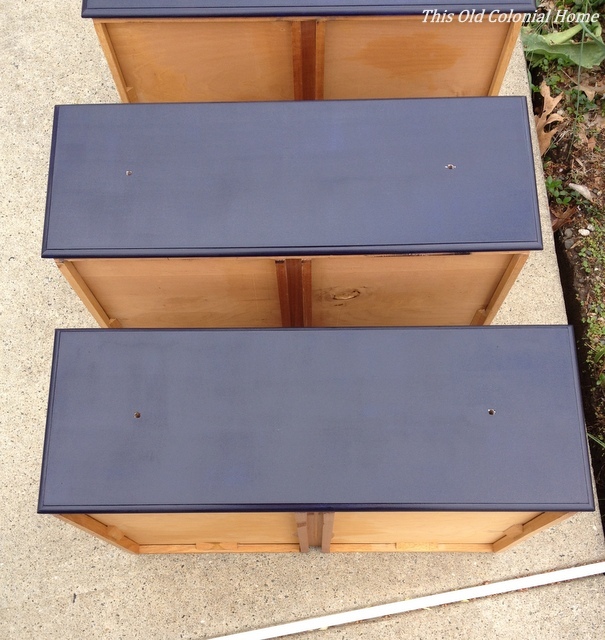 It was easy to spray on and I was able to do the recommended 3 coats pretty quickly. Once it was dry, I added new hardware, which I had ordered from Lowe’s. 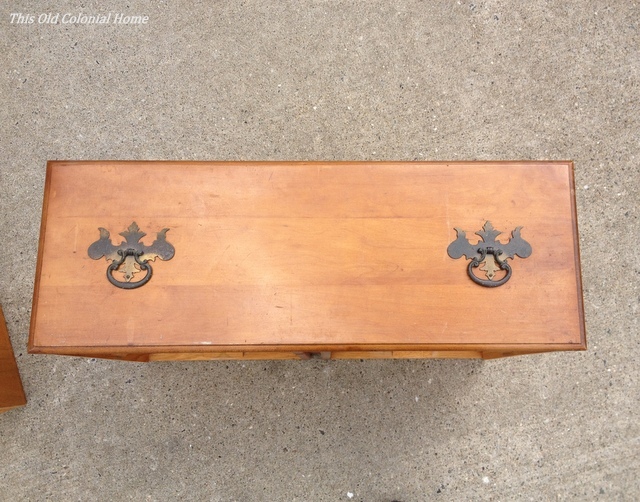 Love this antique look! The entire project definitely took me way longer than I had anticipated (3 separate weekends), but I am so happy with how it turned out! And all of my hard work paid off, literally — the total cost was less than $100!! 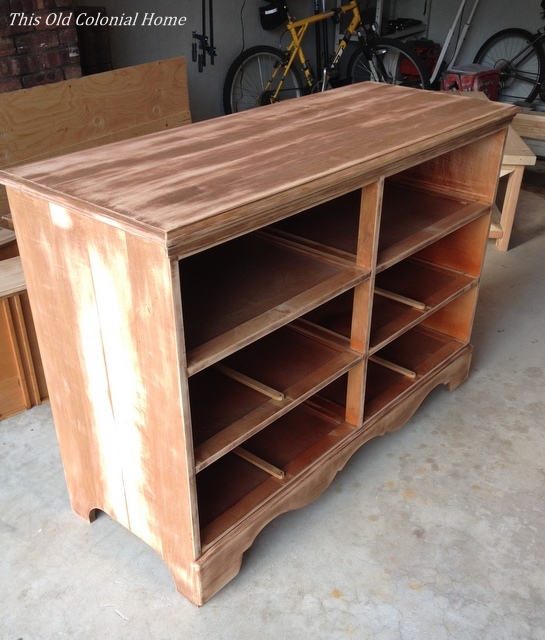 Categories: DIY, Fun Finds | Tags: console, diy, dresser, hardware, paint, polycrylic, sanding, TV stand | Permalink.